The beautiful Daria collection vanities stand out in any bathroom with strong, clean lines, raised panels and elegant counters with square sinks. There's plenty of cabinet space, the fully extending drawers are dovetail construction, and chrome detailing completes the look. Daria vanities deftly combine the function of today with a nod to the elegance of the past. It's the new modern classic styling with a contemporary twist. Inspired by mid-century modern console design, the Coventry Collection from Avanity features solid teak construction with minimal ornamentation. The 72 inch natural teak Coventry features soft-close doors and drawers, sturdy and stylish splayed legs, and an abundance of storage space. Teak is the perfect material for bathroom furniture, as it is both durable and water resistant. With Coventry form follows function with superb simplicity. Marrying mid-century modern design details with the durability and water resistance of solid teak construction, the Harper Collection from Avanity will be the highlight of your bathroom space. Splayed tapered legs, louvered doors, soft-close hinges and glides all testify to the aesthetic care we put into designing this collection. Available in multiple sizes and natural teak, Harper provides abundant storage without sacrificing essential beauty. This Cambria 62-inch double sink bathroom vanity fits nicely in a large bathroom and provides plenty of storage space. The interior is accessible through four drawers with full extension drawer glides and four doors that have free swinging full wrap inset hinges. Made of birch and plywood with a dark mahogany finish, the unit adds an attractive touch with its genuine travertine countertop and antique brass finish hardware, Faucet and mirror sold separately. With its dark espresso brown finish and multi finish chrome pulls, the Simpli Home 30-inch Urban Loft Vanity fits beautifully with a contemporary look. 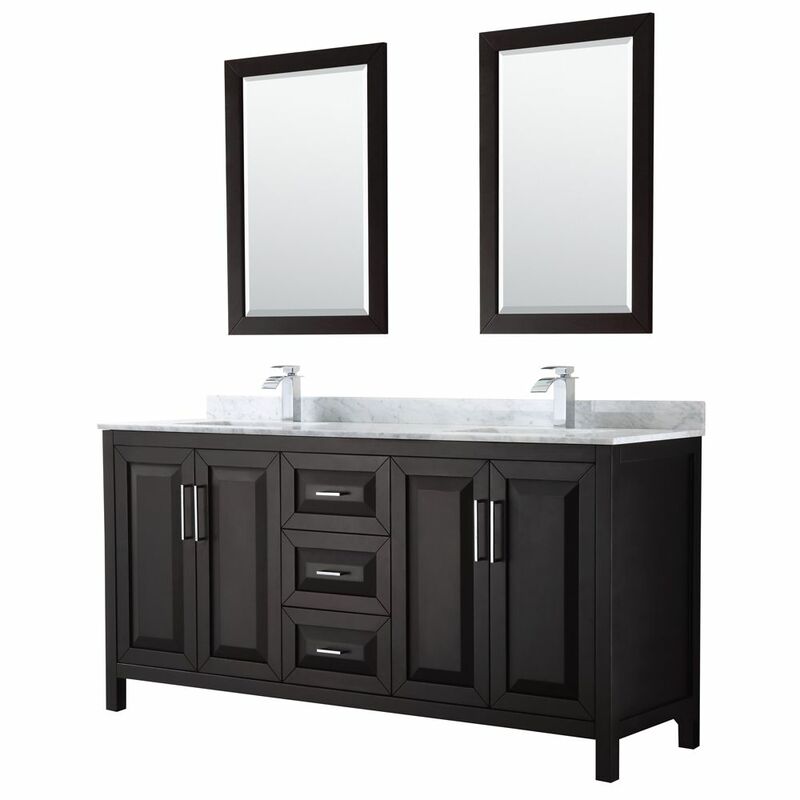 The vanity offers ample storage with 2 doors concealing an internal shelf. It has a white quartz marble top with an under mounted oval sink. The unit comes pre-assembled. Daria 72 inch Double Vanity in Dark Espresso, White Carrara Marble Top, Square Sinks, 24 inch Mirrors The beautiful Daria collection vanities stand out in any bathroom with strong, clean lines, raised panels and elegant counters with square sinks. There's plenty of cabinet space, the fully extending drawers are dovetail construction, and chrome detailing completes the look. Daria vanities deftly combine the function of today with a nod to the elegance of the past. It's the new modern classic styling with a contemporary twist.